Elisabeth Jensen's beautiful best selling AUSET EGYPTIAN ORACLE, Ancient Egyptian Divination & Alchemy Cards are available here. These beautiful 44 cards and guidebook give you access to the magical powers and sacred wisdom of Auset, Mother Goddess of Healing and Prophecy. also known as Isis who is the most loved of all the Egyptian Goddesses. Auset has imbued these cards with her Divine Intuition so you will always find them highly accurate and reliable for personal or professional readings. All the major Gods and Goddesses of Ancient Egypt also offer you their wisdom and guidance through the beautiful artwork of renowned spiritual artist Marie Klement and the Channeled Writing of Elisabeth Jensen, High Priestess of Auset. Elisabeth is also author of Isis Lotus Oracle Cards and her strong connection to the Divinities comes from leading many Sacred Journeys to Egypt. Auset Egyptian Oracle Cards were firstly self published through Love and Write Publishing but quickly became very popular so are now published worldwide through Rockpool Publishing www.rockpoolpublishing.com.au. We regret Elisabeth’s first card set Isis Lotus Oracle Cards are now out of print and unavailable. 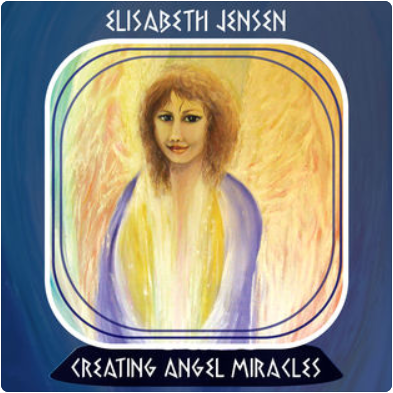 These amazing meditation CDs were designed to complement the Angel Miracles Courses but may be used by by any person desiring to connect with Angels to manifest healing and miracles for themselves. Wonderful for those seeking to self heal and includes instructions for this process. The Angels infused much love, energy and blessings into these beautiful meditations and they are very powerfull! Elisabeth receives MANY emails and wonderful comments about them! These meditations will enhance your experience of Isis Lotus Healing, but are designed for those unable to attend classes also as the first meditation is an Initiation into the Isis Healing Energy. A powerful experience as Isis infused these CDs with her amazing Electric Blue Healing Energy and they are channelled meditations containing much energy. Includes very effective Karmic Release process. Elisabeth’s third CD ISIS MYSTERIES is designed to be used following the Isis Lotus Healing CD and with the Auset Egyptian Oracle Cards. These meditations take you on a Soul Journey to Past Lives PLUS to the mystical Halls of Amenti for truly powerful healing. Includes highly effective Akashic Records (Past Lives) clearing. Encoded with Isis Blue Peace Blessings energy for a remarkable and powerful healing experience. We suggest you see a sample of the DVD on YouTube & plus extra information before purchasing this powerful DVD. Includes actual channelled meditations by Elisabeth recorded inside the Queens and Kings Chambers of the Great Pyramid of Egypt -- this is very rare and special footage! There are two version of the video -- both recorded at the same time. Very unusual images appear especially during the second version! (*) PLEASE NOTE! This DVD was recorded on the most powerful date of 11/11/11 (11/11/ 2009) – a portal time for energies from the Archangels & Ancient Egyptian Divinities & White Light Beings from Sirius flow their combined energies through the Great Pyramid to Connect Heaven & Earth. Private access to the Great Pyramid is difficult at any time let alone to record inside there. At the last moment out time was reduced by 1 hour by Egyptian Authorities so we had only 3 hours in total that day – 1.5 hours for the Group Initiations in the Queens( Isis) Chamber first & 1.5 HOURS ONLY to record the video which had to be done using small video cameras. We have made this unusual video available so you might enjoy & receive the powerful Energy from the Star Sirius & Goddess Isis received in the Queens ( Isis ) Chamber that day plus understand the true purpose of the Great Pyramid as a Temple of Initiation. Variations in quality of sound & images appear due to the incredible energy that day – it is not edited to allow the Siriun Star Blessings Energy to flow through for you as you watch the channelled meditation quietly. When Elisabeth trance channels the Goddess Isis PLUS the Star Blessings Energy from Sirius together in such a Power Place you can expect the unusual – some people have reported hearing different words spoken through her on different days as they listen or even that the video occasionally stops working due to the intense energy but is fine the next day or in another DVD player. The Isis Lotus Healing energy was first received by Elisabeth in the Isis Chamber & even today courses are often accompanied by distinct energy shifts & strange sounds in the building it is taught in during the Initiations – such shifts are necessary to align our earth & ourselves to the higher realms of Sirius & to upgrade our DNA. A wonderful way to connect more closely with Goddess Auset/Isis & the Ancient Egyptian Divinities for profound healing & insights into your life. The complete set is excellent value plus the Isis Mysteries CD is VERY esoteric & use of both Isis Lotus Healing Meditation CD & Auset Egyptian Cards THEN the Isis Mysteries CDs gives you the best results for understanding the process of working closely with the Divinities before your Sacred Journey to the Halls of Amenti can be usually possible for your Spiritual & Soul Healing. Highly recommended for those with complex personal lives ...to resolve these Karmic issues. Includes both Isis CDs & Angel Miracle CD ( not shown) plus the new edition Auset Egyptian Oracle Cards! This complete set will truly enable you create healing miracles in your life & provide you with great solace & comfort for many years to come...all the meditations & insights you need to clear Karmic blockages, pain & sadness from your life. We recommend you start by listening to the Creating Angel Miracles CD first, then move on to Isis Lotus Healing CD, then after working with both of these CDS for a few weeks plus the Oracle Cards you will be ready for your Life Transforming Sacred Journey to the incredible Halls of Amenti located beneath the Great Pyramid of Egypt. Includes all 3 CDs ( not shown) plus Auset Oracle Cards & Egypt DVD!